On Monday, January 25th, The Bronx Defenders hosted U.S. Supreme Court Associate Justice Sonia Sotomayor for an evening of conversation at its justice campus in the South Bronx. Local community members, staff members and supporters of The Bronx Defenders were present. 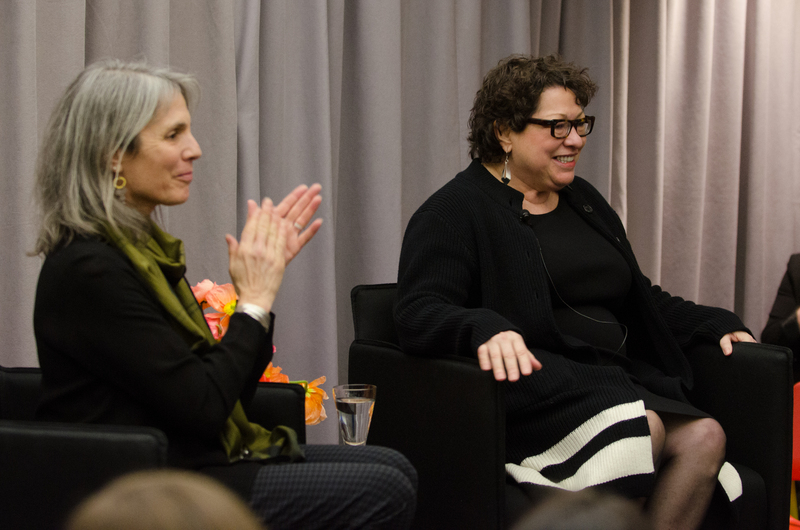 The conversation between Robin Steinberg, Executive Director of The Bronx Defenders, and Justice Sotomayor detailed the Justice’s childhood growing up in the Bronx of the 1960s, her legal career, and her assent to the Supreme Court. Following the conversation, three Team Leaders, all daughters of the Bronx, honored Justice Sotomayor with the “Partner in Pursuit of Justice” award for her exceptional accomplishments. Justice Sotomayor was born to Puerto Rican immigrants and raised in the South Bronx. A graduate of Princeton University and Yale Law School, she has worked at nearly every level of the judicial system over the course of her career. Justice Sotomayor was an Assistant District Attorney in Manhattan from 1979 to 1984, and then entered private practice as a general civil litigator at the firm of Pavia and Harcourt. Her judicial service began in 1992 with her appointment to the United States District Court for the Southern District of New York, and continued with her appointment to the U.S. Court of Appeals for the Second Circuit in 1998. In 2009, President Barack Obama nominated Sonia Sotomayor to the United States Supreme Court. She is the third woman and the first Latina to be appointed to the United States Supreme Court. The evening of conversation with Justice Sotomayor is at the heart of The Bronx Defenders’ work, bridging the communication and resource gaps that exist in the Bronx. Justice Sotomayor has maintained strong ties with her family and community here in the South Bronx. “We were so honored to host Justice Sotomayor at The Bronx Defenders. It was a lively and inspiring evening that I know the Bronx community will remember for a very long time,” said Robin Steinberg, Executive Director.